Miss Pirisi’s second attempt at a Carl Marletti Fraisier recipe with Pate d’amande blanche. Carl Marletti is a highly celebrated Chef Patissier who today is at the heartbeat of innovative contemporary patisserie in Paris. His boutique alone speaks contemporary: studio lights, sandstone walls, cabinets trimmed with modern lines even his name is written in rounded sans serif, all complimenting the signature work that is Carl Marletti patisserie. Strawberries in general are expensive. French strawberries are even more expensive, even in France! And a Fraisier is expensive to make, it’s why a lot of patissiers will stick to making the Fraisier only during the berry season and not all year round. A Fraisier is a wonderful way for patissiers to showcase quality ingredients with their creativity. Clientele demande le Fraisier. Nothing says more than summer has arrived when you see the first Fraisiers in window displays. The magazine SAVEUR where you’ll find his recipe comes only in a French edition and is available in France only or you can subscribe to SAVEUR. I’ve asked permission to translate and post the recipe in English, waiting on answer. 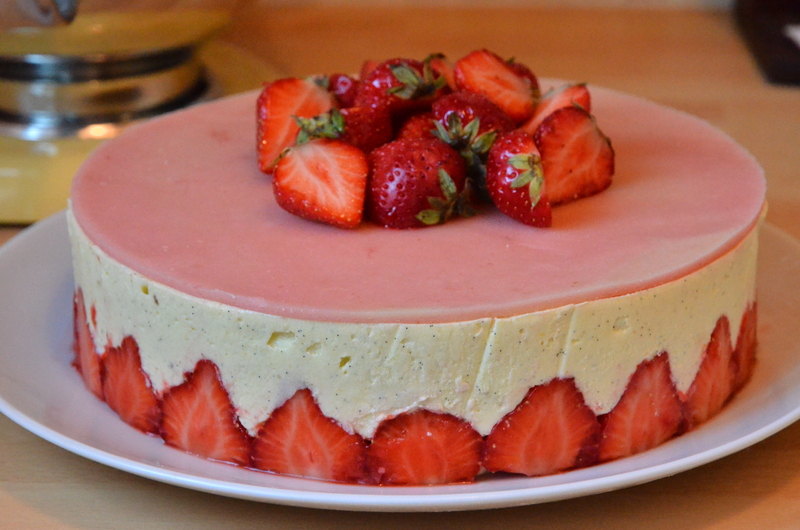 Miss Pirisi’s first attempt at a Carl Marletti Fraisier recipe with Pate d’amande fraise. 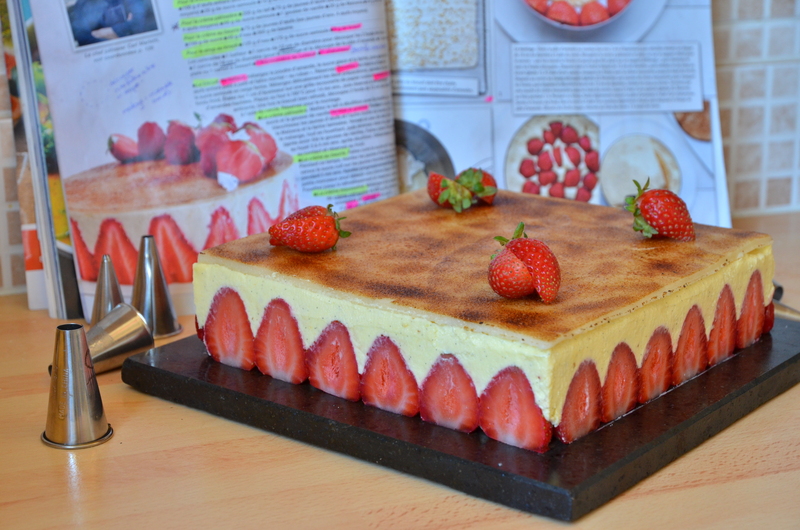 Le FRAISIER MARLETTI published by SAVEURS magazine No.204 September 2013 edition (French) This recipe is translated by me. Individual recipe titles are in English and (French). Anything written in (brackets + italic) are my notes. Preparation: 2h30 + 2 hrs of refrigeration. For 6 – 8 people. – Cake ring of 12 cm in diameter (to cut the 2 bottoms (or bases) of the Joconde sponge biscuit. In a mixer mix the almond powder, the icing sugar and the flour, then add the eggs little by little and bring it up to a ribbon texture. Leave to the side. Whisk the egg whites and the granulated white sugar to firm white peaks. Mix delicately the two preparations, add the cooled melted butter. Spread the mixture 1 cm thick on a grill covered with baking paper, now powder it with almond shavings. Place in oven at 180 degrees celcius for around 14 minutes, then reserve at room temperature. Once the Joconde sponge is cooled, cut 2 rounds of 12 cm in diameter with the cake ring. Reserve for the assembling later. Boil the milk with half of the sugar and with one whole vanilla pod split and scraped. During this time, in a bowl, whiten the egg yolks with the other half of the sugar. Then, add the Maizena and the sifted flour. Pour a little bit of the hot milk on the egg mixture whisking at all times, then reverse back into the casserole (just after removing the vanilla pod). Cook altogether whisking for around 3 to 4 minutes after boiling. Remove from the stove, put into a dish and film in contact (“en contact”) and leave in the refrigerator. Cook the sugar and water to 121 degrees celcius. During this time, whisk the egg yolks then pour the cooked sugar on the eggs, mixing for around 1 minute. Add the butter piece by piece to obtain a cream that’s smooth and homogene. Whisk until the egg mixture cools down and reserve at room temperature. 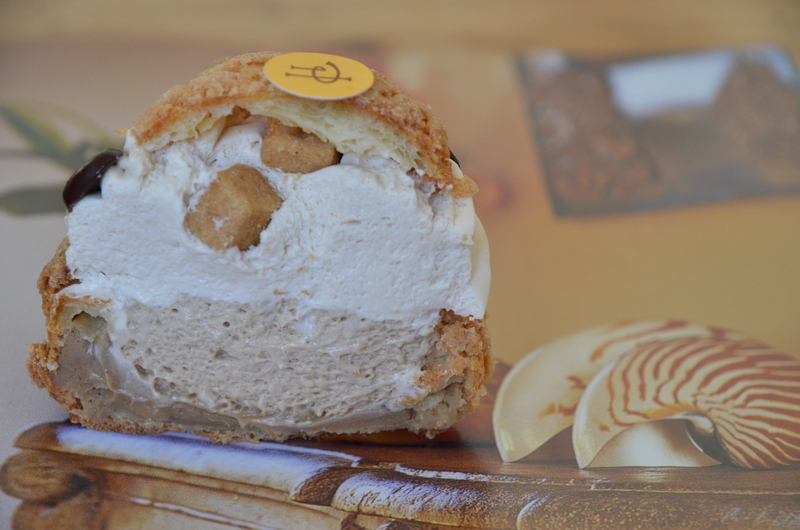 The Mousseline cream : (La creme mousselin): Mix with a spatula 500 grams of pastry cream and 450 grams of butter cream together checking that you don’t have any chunks, lumps or grains. Reserve. The Kirsch syrup (Le sirop au kirsch) : Heat the water and the sugar. Leave to cool and add the Kirsch. The strawberries (Les fraises) : Remove the tale (green part) of the strawberries and cut in two in the longer direction, then decor the stawberries. Thin out the almond paste with a rolling pin (about 3 mm thickness), then cut a disk of 16cm in diameter with the help of the cake ring. Now put the cake ring on your chosen support which is your plate or round cardboard for the service – once installed the fraisiar can not be moved to another support, then place the cutted strawberries up against the inner ring. Put one 12 cm diamater biscuit on the bottom, then soak it with the Kirsch syrup using a brush. A the help of a spatula, cover or hide the straweberries with the cream mousseline to the top of the circle. Place strawberries in the centre. Spread another layer of cream mousseline for cover the strawberries, then place the second biscuit of 12 cm of diametre, soak in sirip of kirsh. Finish by a layer of mousselin cream unitl the top of the circle. Smooth with the help of a spatula. Reserve to cold for 1 hr. During this time, lightly colour (caramelize) the almond paste by torching.Take out the strawberries from cold, remove the circle with the help of a hot knife, then put the disk of almond paste on top. Decorate with red fruits and reserve in cold for 1 hour before serving. 3. The pastry cream and butter cream mixed only with a spatula using soft calm movements. 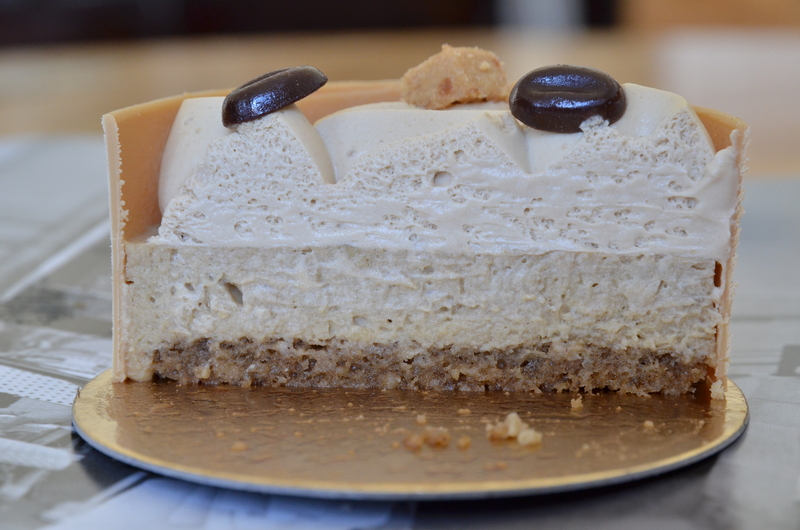 My gourmandise is in the DNA, it comes from my father. The sweet tooth I have, also comes from father. So this blog probably wouldn’t have come to be if it wasn’t for the seeds my father planted during my childhood for the appreciation of Europe’s patisserie and fine foods. Being a kid in Australia in the 80’s meant eating Lamingtons and Hundreds and Thousands. I was very happy to eat only this. My Hungarian parents however were not, they were nostalgic for European cakes and unfortunately for them this was almost impossible to find during the 70’s and 80’s in Sydney. There were a couple of cake shops on the Eastern suburbs of Sydney run by Hungarians/Austrians, one in particular I remember along Bondi Beach, going there on the weekends was a pilgrimage for my father. He would order his childhood favourites: apricot danish, profiterols, vanilla slice (millefeuille), Dobos torta, Esterhazy torta, Black Forest, apple strudel, poppy seed strudel, cherry strudel…. I’m sure I’ve missed a few. I remember the creme patissiere under the apricot of the danish, ooh how I loved that. Let’s not forget the smelly cheeses. What horror for an Aussie child to eat cheese that was blue! While my friends enjoyed their Kraft cheddar my father insisted that I eat camembert, brie and Roquefort. What cruelty! How I laugh about it now. These are now my favourite cheeses! Then there were the school holidays. Instead of sleeping in, watching cartoons over cereal, I had to go to work with my father. Can you imagine!? It was the worst. My father was a mechanic and an owner of a service station. Petrol tankers would come early which meant my father put his alarm on for 4am! We’d have to to be at the service station to open by 5am (or was it earlier?). It was torture for me. My father knew that this was possibly extreme for a young child, so to ease the pain, on our way to work or just after opening we’d stop off for some “petrol” as he’d call it. Petrol meaning fuel. Fuel meaning croissants, danish and strudel. Okay, that wasn’t so bad. Petrol came as another type of fuel/persuasion: Chocolate. My father, the military thinking man, every Sunday ran 21 kilometres. Who would have to join him? Me. It was not up for discussion and again I couldn’t sleep-in. As a young child I’d ride my bike along side my father while he ran, then as a teenager I’d run with him. Our Sunday run had a tradition: we’d make 1 stop at the Newsagency where my father would by us our lucky scratchies, as well as buying me 1 chocolate bar and that was to be my fuel for the 21 kilometers. I think it worked because in school I was one of the fastest long distance runners. Living in Europe I’ve discovered what my father was so nostalgic about: the magic of patisserie and fine foods really lies in the heart of Europe. And it’s my DNA that will continue to seek the fuel I so needed at 5am and on those long distance runs. Here’s to you Papa. Happy Fabulous 70th Birthday! It’s come to my attention that Pierre Hermé has his elbows up in coffee beans. He’s always up to something in the world of saveurs, this time it’s with two coffee varieties: Cafe Bourbon Pointu de la Reunion and Iapar Rouge du Brésil. He’s expressing these coffee varieties through a limited collection called Infiniment Café. The collection includes viennoiserie, entremets, tarts, and millefeuille. But there’s a catch. The collection is only available until 20 October. Here’s the hit of coffee I had at Pierre Herme (from top to bottom): Moka Infiniment Cafe Iapar Rouge Bresil, Chou Infiniment Cafe and Millefeuille Infiniment Cafe Iapar Rouge du Bresil. Note: This is not the full Infiniment Cafe collection. 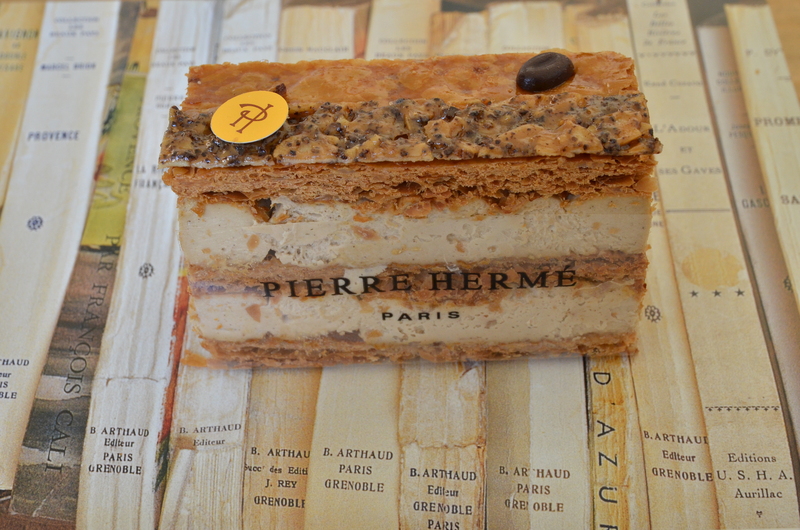 To see and taste more visit the Pierre Herme website, or better yet, visit his boutique. 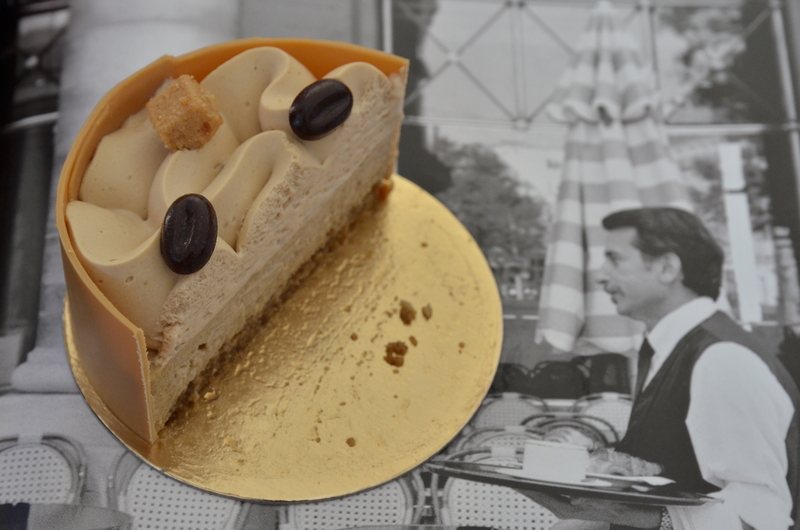 The background photographs I used to display Pierre Hermé cakes are those of Australian photographer, Carla Coulson. Her photographs are from her published book Paris Tango, and the book My French Life, author Vicki Archer.